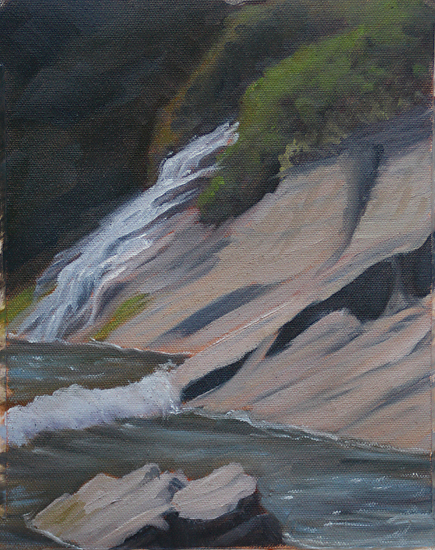 Every now and then I take a stab at painting the falls at the north end of Short Sands. Most of the time there is tiny improvement and I get a little closer to what I want to convey. The cliffs in this area are actually formed from ancient seabed. The "rock" is soft and crumbly and has many layers. 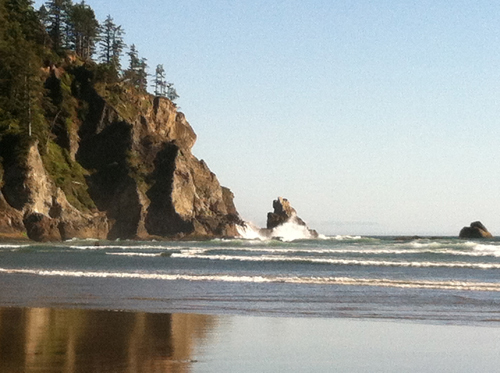 It has been carved by sea, wind, and rain. It is quite beautiful and has been very challenging for me to depict to my satisfaction. I learn something more every time I paint it. 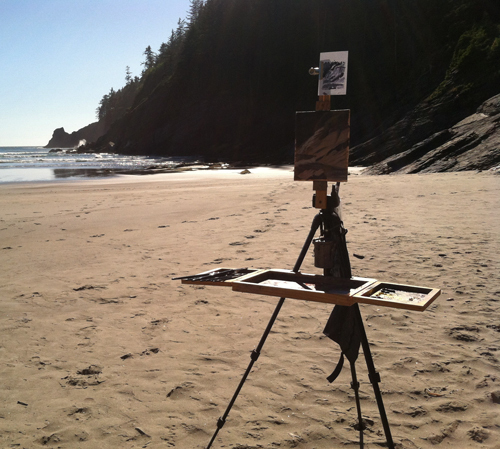 I painted in the late afternoon when the tide was just coming to its highest point. What I have the hardest time with, along with a few other things, is depicting the scale of the falls. I am actually a bit of a distance away since it was high tide. During the lower tides, it is possible to get to the foot of the falls. They are far, far larger than what they look like here. The shadows in this area change quite rapidly and dramatically too, no matter what time of the year. I will keep trying. With every study I see more and more. Here are a few pictures of work in progress and the area. As can be seen in the picture with my easel, the area I was painting was in shadow within a fairly short time-span. I have been doing my Notan sketches before starting to paint and am finding them immensely helpful, specially when the light and shadows change so fast. The last picture is looking south as I head back to the car which is about 1/2 a mile away through a beautiful old growth forest trail. I plan to paint this view too but will need to wait for the right tide. The waves were much larger than they looked and quite powerful. Today I got my new two-year park pass and worked on my gear and in the studio. We will be having a warm weekend here on the coast. Lovely study Renee! Hot inland too.